To find out how to disconnect your account, scroll to the last section of this doc. For accessing both your Client ID and Client Secret, you’ll first have to create a new User who is assigned a custom Role with the correct API access permissions in Marketo. First, click Admin in the top right of the screen, same as you did for finding the Munchkin Account ID. Finally, click Create and you should now see your new User Role listed. You can double click to edit this at any time. For now, there are still no Users assigned this Role. Checking Access API limits ‘read-only’ permissions of users to ‘API Only Role’ depending on the type of API they need to access such as, Read-Only Activity, Read-Only Campaign, Read-Only Assets, Read-Only Activity Metadata, and various other types of read-only access along with ‘Approve Assets’, and ‘Execute Campaign’ permission. Invite a new User by clicking the Invite New User button. Check the box for API Only. Click Send, which you should be able to because an Invitation won't be required for API only access. After successfully doing so, the User that you just invited should appear at the bottom of your Users list. Now we just have one more step before being able to find the Client ID and Client Secret! Click LaunchPoint from the sidebar. If you're unfamiliar with how Launchpoint works, then refer to Marketo's description here. Select Custom for the Service, and for API Only User select the teammate who you just assigned the new custom role. Our suggested description is "Service to allow Drift access". After clicking Create to complete adding the new Service, the Drift Integration should again be listed at the bottom of the table list. Finally, you can click View Details to find both your Client ID and Client Secret. Woohoo! You should have all three pieces of information that we were originally looking for :-) Once you have your Munchkin Account ID, Client ID, and Client Secret, enter them in Drift’s Marketo integration page. You can find it in your Drift account under Settings > Integrations. And you're all set. If you have further questions or are running into trouble with connecting your Marketo account, just chat in with our Customer Advocate team or email cguo@drift.com. 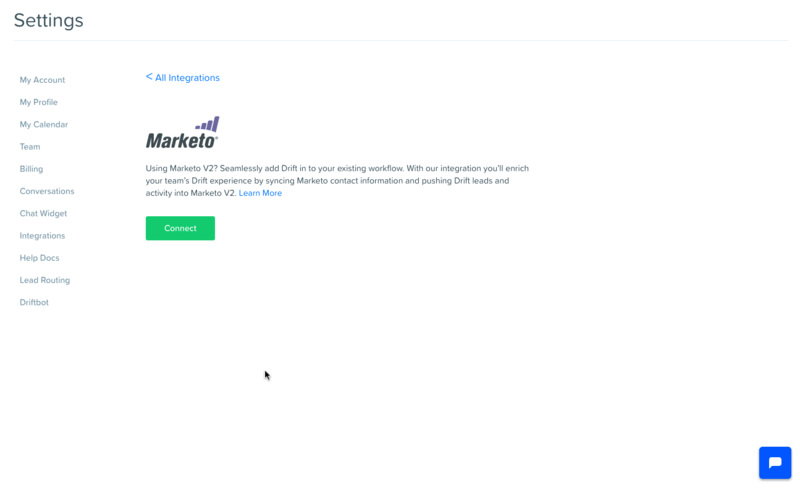 If you choose to Disconnect the Marketo Integration, you'll see the pop-up below to confirm that you would like to disconnect. Don't worry about keeping mapped attributes and users, as long as you reconnect with the same account, we will preserve those settings.